Vitamin A 9.4%, Vitamin C 11.5%, Calcium 16.6%, Iron 10.1%. Prepared using low sodium, low fat cream of celery soup, skim milk, no salt added peas and lightly salted Kettle chips. 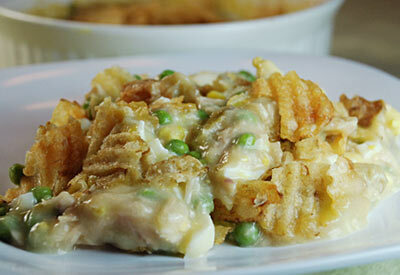 In 1 1/2- quart buttered casserole, blend soup and milk; stir in tuna, eggs and peas. Bake at 350 degrees F. for 25 minutes or until hot; stir. Top with chips; bake 5 minutes more. Serve each portion over half a toasted English muffin.